This year has been busy with so many things. The community here at steward Wood has just submitted a third planning application to Dartmoor National Park; the result of many months of hard work. I won’t go in to all the gory details here, but if you are interested you can find out more about the history of Steward community woodland and planning permission over the last 14 years on the Steward Community Woodland website. 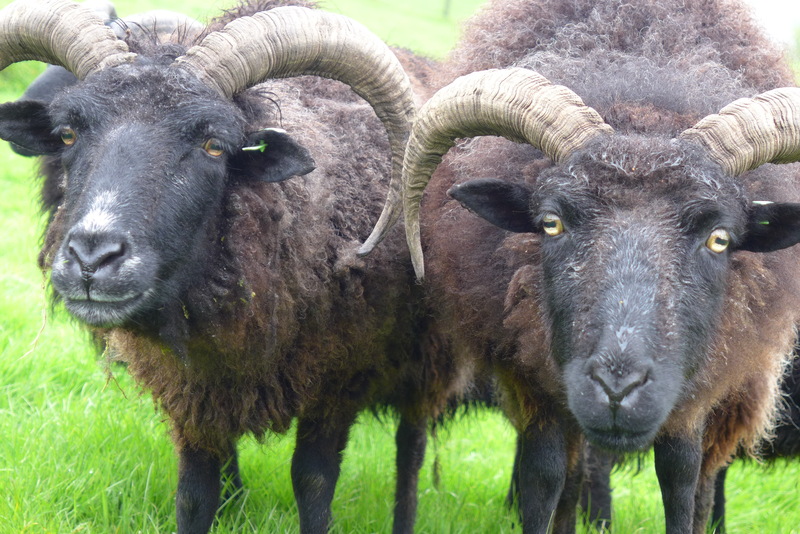 Fern and I have taken on a small flock of Hebridean sheep which are kept a couple of miles away on a friends farm. So we have become joint caretakers of these primitive, horned, wooly beasties. So far we’ve learned to ear tag sheep, treat fly strike, hand shear them, move them from field to field, (pure comedy), protect apple trees from being nibbled, check their feet, how to wrestle them upside down to be health checked or treated for ailments and many more things besides. Never a dull moment. We’ve had visits from the forestry commission for suspected Phytopthora Ramorum, a fungal disease affecting Japanese Larch, and it looked like we would be served a notice to fell all the larch on our 32 acres, (a lot of larch) with a tight deadline, meaning work around the clock for two or three months. But lady luck was smiling on us because it turned out to be a false alarm, for now at least. We’ve also been visited by The Wildlife Trust who were very complimentary about all the great work the community has done over the years to encourage natural regeneration and to increase the biodiversity of the flora and fauna of the woodland. 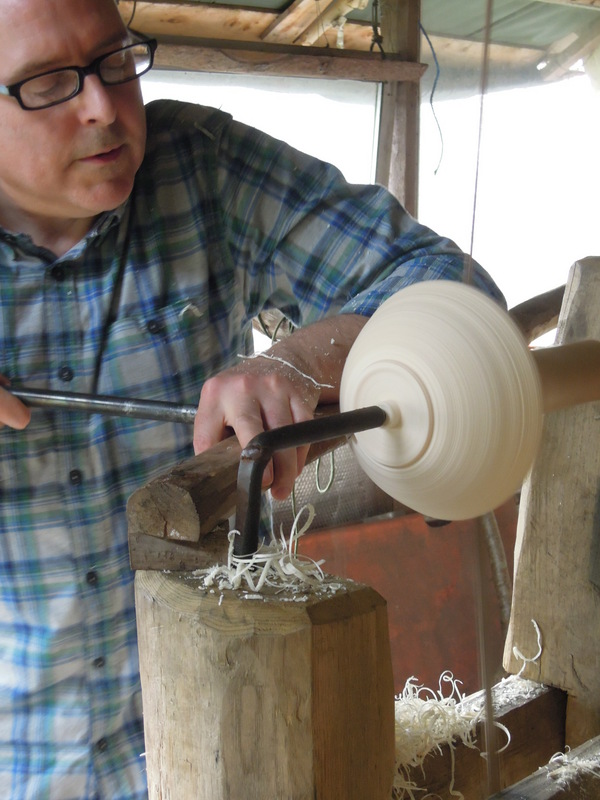 On top of such things and many more excitements, I have had the busiest year of courses so far, with multiple visits each month for either spoon carving, pole lathe bowl turning or hook tool forging courses. I have not been documenting most of these courses in the way I once did for fear of boring blog readers to death with yet more happy faces with spoons and bowls, but there are a few old pictures which I’ve been meaning to add here for far to long, so here they are with a brief explanation of why I have included them. The spoons above (and the middle one shown from the other side, below), were not carved here on one of my courses but left for me as gifts by two people who attended my bowl turning/hook tool forging courses. Both are very highly skilled spoon carvers. The eating spoon on the left is carved by Simon Hill from apple wood and has very tidy carved engraving patterns on the handle. This spoon is one of my favourite eating spoons, the flat edge of the spoon bowl works very well indeed. 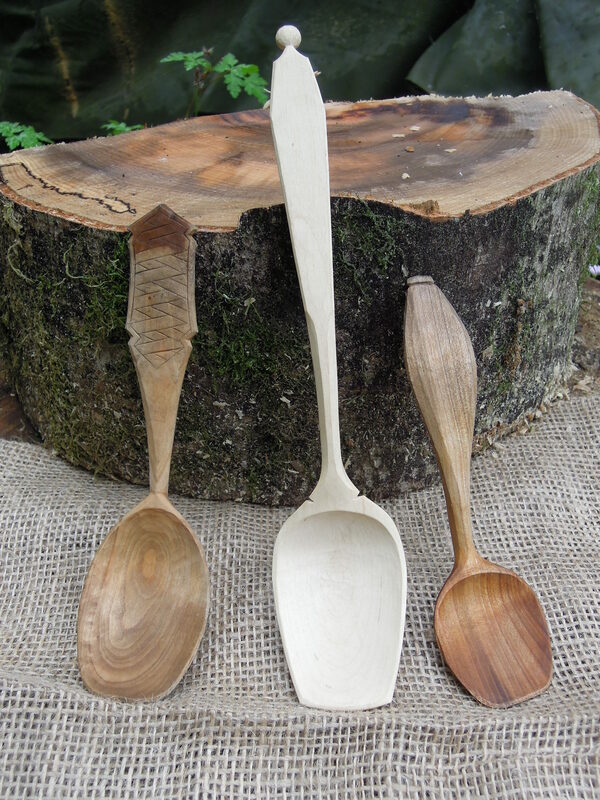 The larger, un-oiled serving spoon and the smaller teaspoon were carved by another spoon carving great; Nigel Leach. The server was carved from hazel which Nigel harvested from the woodland here, and the teaspoon he carved from cherry. They too are exquisite examples of masterful technique and design and both are in daily use here at home. 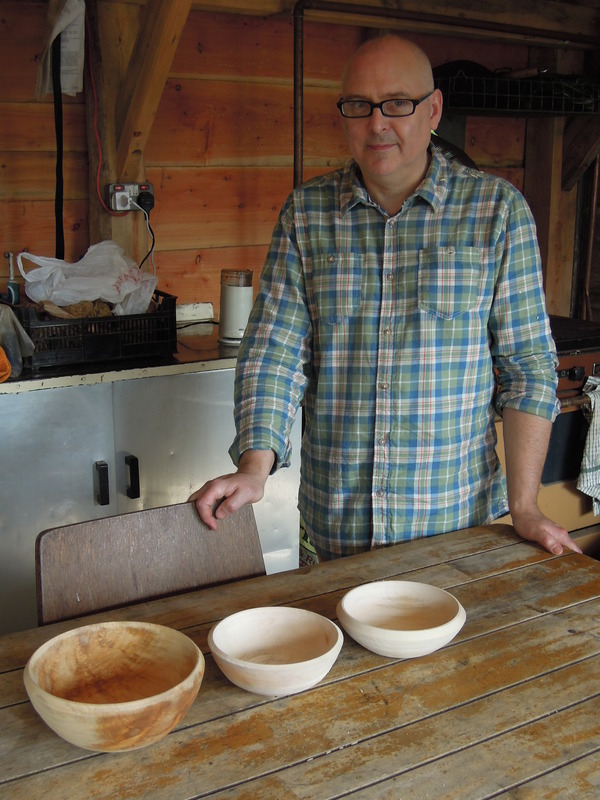 Nigel Leach, below turning the back of one of three bowls he turned during his time here, has a Facebook page for his beautiful work which you can see here. 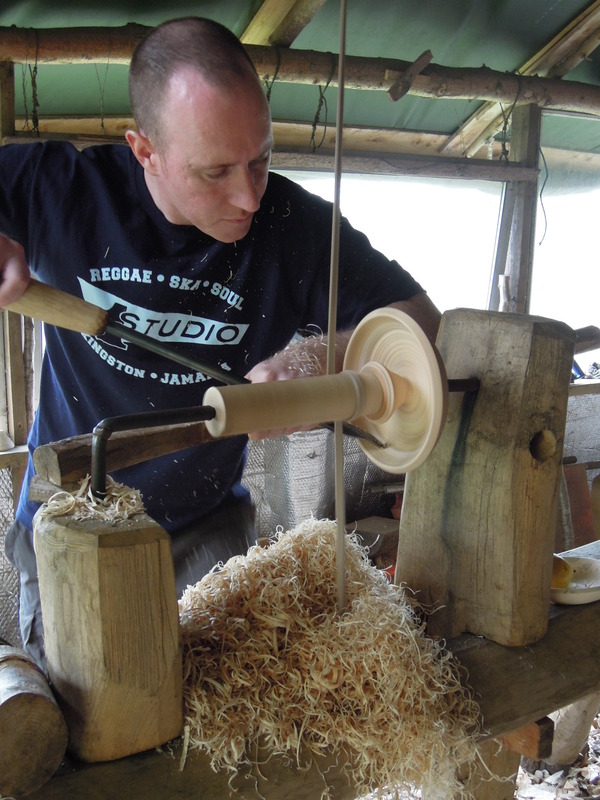 He works carefully and picks things up quickly and I have heard from various other recent visitors that he is already turning out some very tidy bowls from his own lathe. It’s no surprise really as his first efforts were very good indeed. 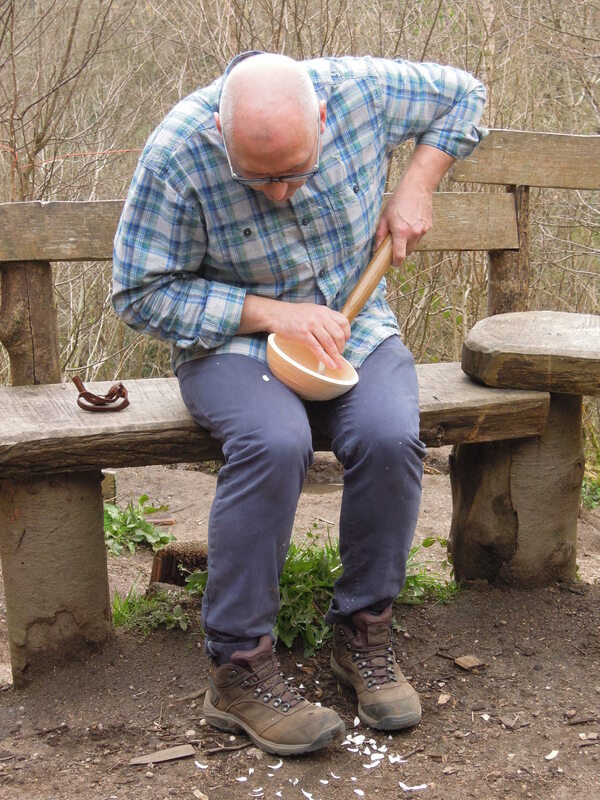 Not long after Nigel, I was visited by Cherie from Bristol who was interested to learn to carve spoons from the point of view of a therapist studying how people learn new skills. I won’t go in to all the details here suffice to say it was as educational and interesting for me as she said it was for her and I wish her all the very best with her work as a therapist in the future. 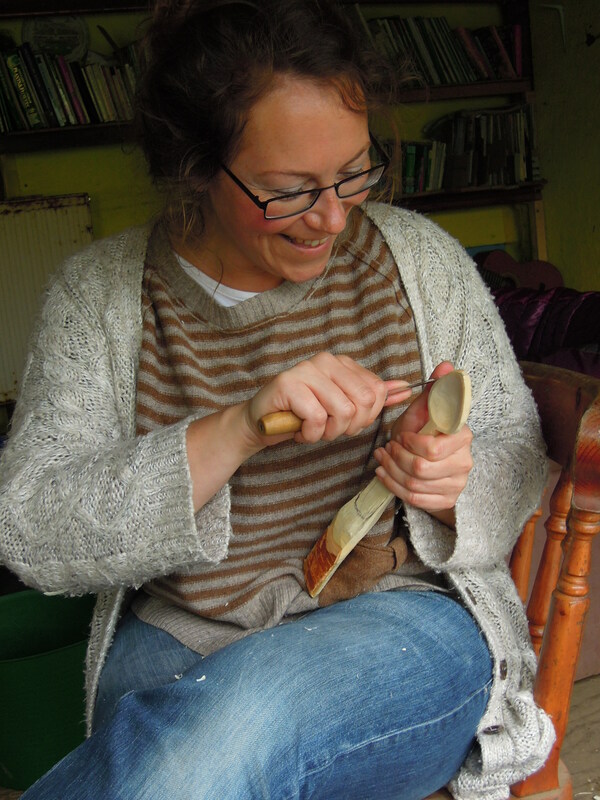 Here she is towards the end of the day happily refining the edge profile of her spoon. 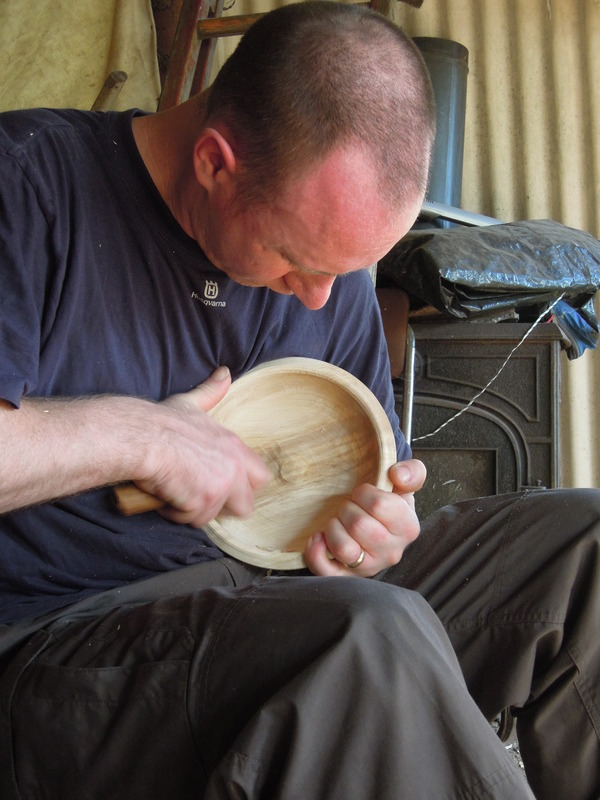 Like Nigel, Simon Hill was not new to carving with axes and knives when he came here on a bowl turning course. His spoons continue to sell well both here and overseas via his blog/website here. Check it out and prepare to drool. Roughing out the blanks was just a matter of course with Simon’s axe working away methodically. The turning tools were a new challenge however, but by the end of the day with three bowls turned Simon was starting to look like he’d been at the game much longer than just a few hours. 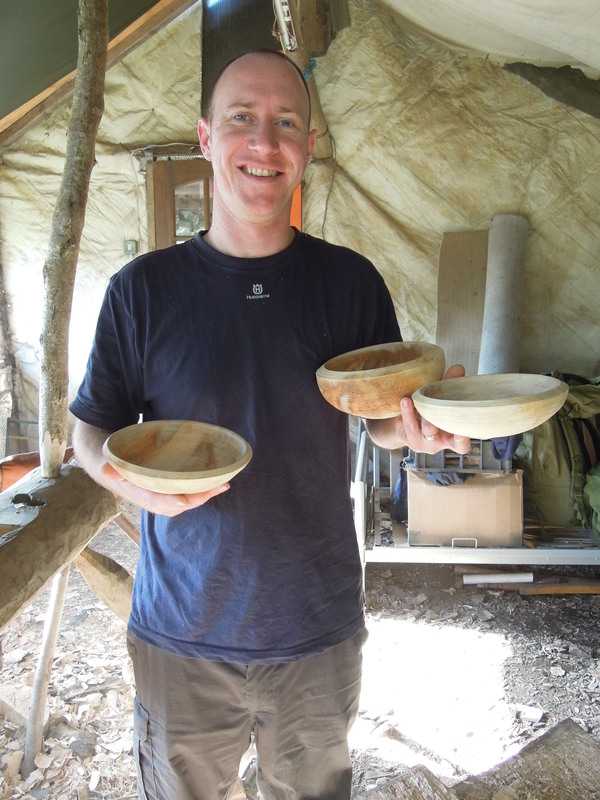 He left with three nice bowls and lots of enthusiasm to build a lathe and get turning at home. He had an accident at work which left his leg in plaster just a few days after being here so there would have been a delay in his plans but as far as I’m aware he has healed up nicely now and I hope he has found time to continue with bowl turning. I wish him all the very best with it. It’s not always people who have previous experience of green wood working who come to visit me here. I often run courses for people who have never used an axe or carving knife before. This was the case for Kay and Rino who came from London for two days. 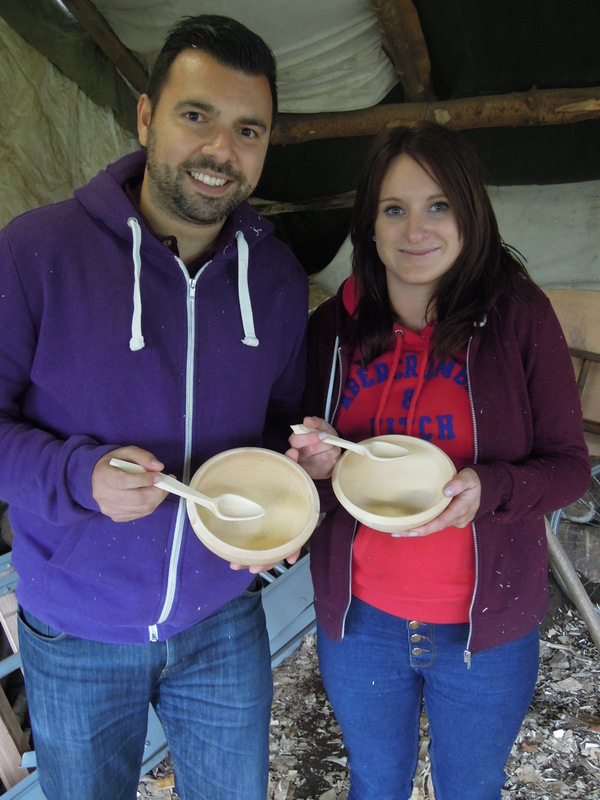 On day one they carved their first ever spoons which they really enjoyed and did very well. Then they both turned a bowl on day two, with a little help from me when fatigue kicked in towards the afternoon. It’s good for me to know what people want from the day. In the case of Rino and Kay it was more about having a new experience and taking away a bowl and spoon each which they had made. The objects have a use and will always be connected to the memory of a shared experience together, doing something completely new, learning a traditional way of working with wood. They may never make a spoon or bowl again. Then again, maybe they will. But it’s less certain than say Nigel or Simon going on to turn bowls in the future. They enjoyed the experience very much and I hope they get many years of pleasure from their wooden bowls and spoons. I thought i’d include just one more person because I’m sure that anybody who is involved with the ever growing green wood working world will soon get to hear of this guy, if they haven’t already. 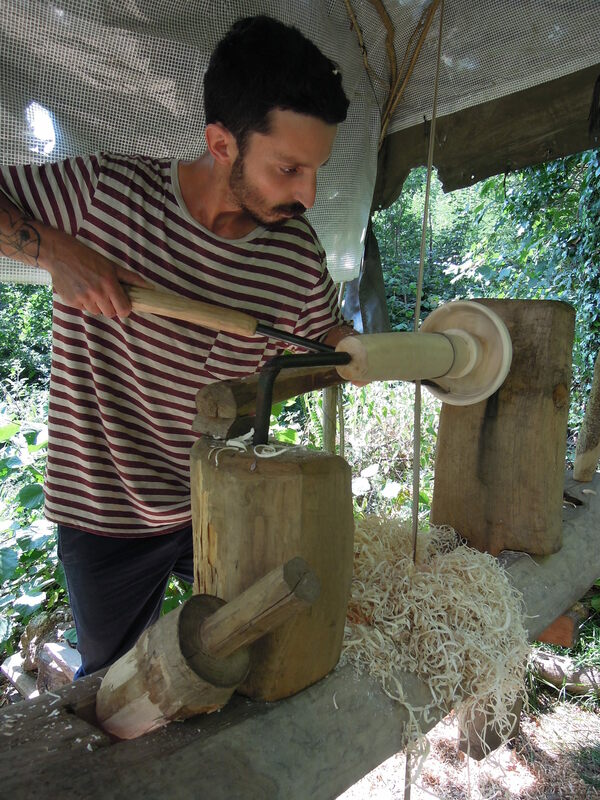 Yoav came to the UK for the annual spoon carving festival Spoonfest this summer from Israel. While he was here he stopped by and forged a tool and turned a bowl and in return he helped us with some of our firewood processing by splitting a huge pile of wood. 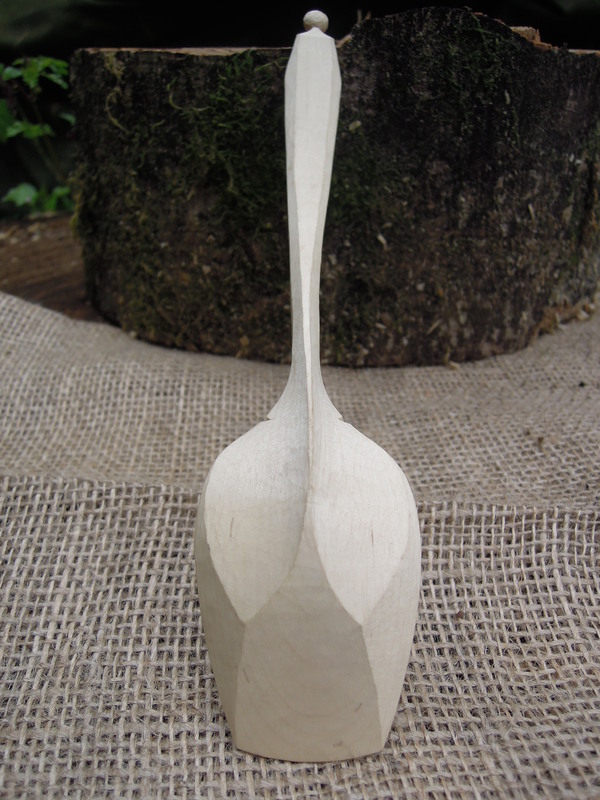 Yoav has only recently started carving spoons but is already creating some really lovely work. He is planning to come back for some time this winter so hopefully we’ll have a chance to hang out and do some more carving and turning together. Here he is on a very hot day in august, turning a bowl while melting like a candle. Happy days indeed! Great to see things are going well for you and the community!